Woorabinda Bushland Reserves, in the Adelaide Hills, is a natural reserve close to the centre of Stirling in South Australia. The Park contains large areas of natural bushland providing significant conservation and biodiversity value to the Adelaide Hills. The 2018 AGM, held in the Environment Centre at Woorabinda, was well attended and very successful. A copy of the WBR chairman’s report 2018 is available (PDF). Working Bee dates have been updated for 2019. A Woorabinda Trails map is available. Check our newsletters for the latest news about the Park. The Friends work very hard to protect and improve the park, and we often need help. 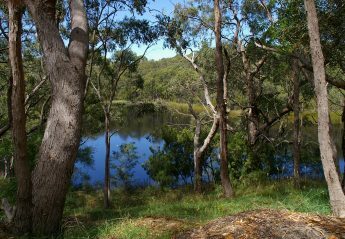 See About the Park for an introduction to the Park, or view the pages on the separate components of Hender Reserve, Madurta Reserve, Stirling Park and Woorabinda. Also check the bird list, which provides links to photos and sounds of many of the birds. You can take a self guided walk around the Woorabinda Lake. A brochure is available to help you get the most out of your walk. Are you interested in joining the Friends of Woorabinda Bushland Reserves? A family can join for just $10 a year, or $40 for 5 years. Print the membership form from the latest newsletter and send it in. Donations to the Friends of Woorabinda Bushland Reserves Fund are tax deductible. If you have any questions about the Park, or comments about the website, please email.